This entry was posted on December 9, 2015 by supplements2u. 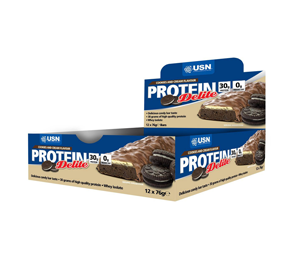 Here at Supplements2u we have recently taken on some new USN products. Namely, USN Protein Delite Bars, and USN Protein Mousse. These two fantastic supplements from USN are of the usual high quality you would expect from them. Protein Delite Bars are an ideal form of protein on the go in a convenient great tasting form. Protein Mousse can be considered more of a treat, but also an alternate food source to increase your protein content from. Read on as we have attached some discount coupons for these USN offers. These bars are a delight (as the name would suggest) and really do taste amazing. I would say it is as close to a regular chocolate bars in terms of taste, texture and bite, but with amazing nutritional qualities. Each 50g bar contains over 15g of protein, almost 20g of carbohydrates and around 8g of fats. Both equally as tasty as each other and both a fantastic source of protein to meet your nutritional goals. Not only do Protein Delite bars provide a healthy source of protein from whey isolate, they also contain zero trans fats (also known as hydrogenated fat). Some customer feedback that we have had range from “these bars are absolutely divine, they taste great and don’t leave any horrible after taste, I can’t stop eating them…”, “exceptional bars, trying not to eat them all…”, “some of the nicest protein bars I’ve ever tried, definitely worth getting if you use them as part of you nutrition when training”. Protein Mousse from USN really is an indulgent protein source. It is a delicious high protein content, low fat and sugar free dessert to help you meet your nutritional goals. An ideal evening snack that really will help you with any cravings and will definitely satisfy your sweet-tooth. Want to read some feedback on these: “tried a sample of this, absolutely delicious, reminded me of Angel Delight, can’t believe the nutritional value of this protein mousse though…”, “strawberry flavour is lush, main reason I got this is to help with my dieting, I use alternate nights…”, “soooo good, I love it, I have such as sweet tooth and USN Protein Mousse is the perfect great taste…”. 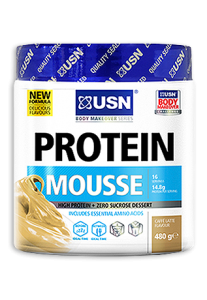 Still not convinced about USN Protein Mousse, to make it a little more tempting, why not use our discount coupon, CMUPM, and save.